Over 100 boys and their leaders from across the Battalion went along on to Renfrew North Church on 16th September – the day after the anniversary. 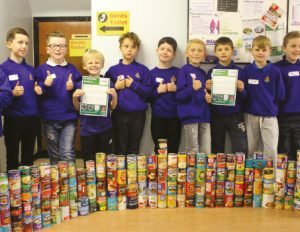 In addition to celebrating the Centenary the day also had the aim of helping the boys and their Companies to complete as many of the Juniors 100 challenges as possible and so instead of a fee to participate we asked boys to bring donations for the local Foodbank and were overwhelmed at the response. The boys scored well over 100 goals in the football shoot out, played marbles, got creative with Lego (using 100 bricks), learned a circus skill, built the highest 2p tower, made birthday cards, made and then flew paper aeroplanes and lots more. A commemorative tree was planted and as part of this included planting a time capsule with notes of what boys enjoy about Juniors. A great afternoon to mark a very special occasion.